If you ever see someone with argyria, you will certainly know it, as the skin will appear bluish-gray in color. The dramatic discoloration results from prolonged exposure to silver in a variety of ways. We all come into contact with small doses of silver daily. It is naturally present in water and food as well as in the air we breathe. Ingestion or inhalation of silver undoubtedly happens through the mouth or nose, but the metallic element can also enter the body through our skin. Once it is in our stomach, a chemical reaction occurs, and the silver crosses into our blood. Silver can remain in our system for up to one week before it is secreted through urine or stool. All of this is normal. However, when large amounts are present in our system, argyria can set in. Argyria is a rare medical condition that indicates excess amounts of silver in the body. The skin turns a blue or gray hue as the chemical compounds of silver darken the skin’s natural pigmentation. The reaction is most pronounced when the skin is exposed to ultraviolet (UV) rays. Argyria can also affect other organs subjected to sunlight. It is not dangerous if it is present in the conjunctiva (the mucous membrane covering the eyelid and sclera), but can have lasting effects on the lens of the eye. The overexposure to silver can happen over a period of time or all at once with a single exposure to large amounts. Removing oneself from the exposure or environment will not stop its presence. Let’s discover exactly what causes argyria. What Are the Causes of Argyria? Argyria is caused by excessive exposure to the element silver, and there are several ways this can happen. 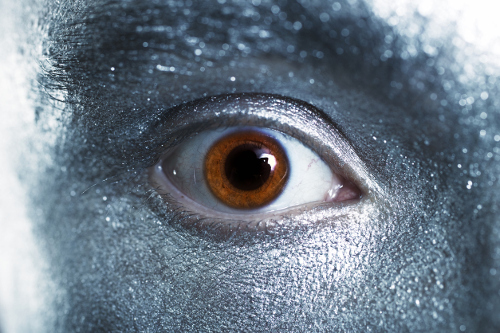 Argyria can be an occupational hazard for those working directly in the silver production field. This includes silverware manufacturing, mining, photographic processing, silver refining, and manufacturing of metal alloys. It could also occur from inhaling the silver compounds over a period of several months to several years. There are prescription medications that contain silver salts. The content of silver in your system rises with usage. It can be absorbed into the mucous membranes by way of nasal sprays and into the skin through the dressing of a wound, or it can enter with eye drops or even oral anti-smoking remedies. Colloidal silver supplements taken to treat health conditions such as cancer, arthritis, diabetes, herpetic infections, and AIDS can also cause argyria. Various surgical procedures that involve the application of silver substances can cause argyria. Dental surgery to treat tooth cavities with silver fillings is one procedure. Another surgical procedure is abdominal surgery that calls for silver sutures to stitch an open wound or incision. While most can wear silver jewelry without concern, there have been cases of argyria due to silver earrings. The same issue can arise with the use of silver needles in acupuncture therapy. Silver utensils would provide the trace amounts we ingest every day. So, you may be wondering why colloidal silver is often used to improve immune function and treat infections. Unfortunately, most food products, medications, and even essential nutrients cause health issues when used in excessive amounts. For example, excess sugar could potentially lead to heart disease, diabetes, and pancreatitis. Iron supplements can result in heart failure and cirrhosis of the liver when consumed in large amounts. Excessive calcium use can present side effects of cellular toxicity, tissue calcification, and malfunction of the kidney and immune system. Liver damage, muscle pain, depression, anemia, and schizophrenia are referred to as side effects of using too much vitamin A. An argyria colloidal silver condition basically follows the same concept. You can use colloidal silver in moderation without any fear of argyria. This product is often used by those with Lyme disease, rheumatoid arthritis, fibromyalgia, lupus, multiple sclerosis, and other degenerative diseases. The problem arises when it is used in excess on a daily basis for prolonged periods of time. If the disease takes effect, it is often harmless, and only the discoloring of the skin will be the main concern in these cases. Obviously, the most apparent of the argyria symptoms is the bluish-gray skin coloration. You will first notice a small spot or hue before it will completely cover all skin surfaces. The advancement of the coloring depends on the amount of silver in your system. High doses of silver can cause the problem to develop quickly, while small amounts of exposure cause a slower progression of the coloring. You may be able to diagnose yourself if you see any discoloring of your skin, eyes, or nail beds. This is when you should seek medical attention. Your levels of silver will be measured by samples of blood, stool, or urine for laboratory testing. A sample of your skin tissue will be taken with a skin biopsy to confirm argyria. A technician will use a microscope to detect any blue-gray pigmentation within the skin cells. Once it is confirmed, you can take steps to avoid further exposure. There is no argyria cure, but there are current clinical trials with laser treatments being researched. Hydroquinone ointment is sometimes used for reducing the appearance of blue-gray undertones. Argyria is a rare but uncomfortable condition that occurs with overexposure to the chemical element silver. The affliction is harmless in most cases, but the bluish-gray hue can be troubling, especially if the person has extremely high levels of silver in their system. It should be noted that silver is not always the enemy. It does have positive qualities for humans as it is used in eye drop medications, healing salves, and bandages. Again, there is no cure, but there are precautions to take to avoid further exposure to silver. “Everything You Should Know About Argyria,” Healthline; http://www.healthline.com/health/argyria-cure#overview1, last accessed May 19, 2017. “What Are the Causes of Argyria Disease? Symptoms & Treatment,” Tandurust, October 6, 2016; http://www.tandurust.com/skincare/argyria-disease-symptoms-causes.html, last accessed May 19, 2017. “Is Argyria a Side Effect of Colloidal Silver Usage?” The Silver Edge; http://www.thesilveredge.com/argyria.shtml#.WR73gGjyvIW, last accessed May 19, 2017. “Argyria,” Prime Health Channel, January 24, 2013; http://www.primehealthchannel.com/argyria.html, last accessed May 19, 2017.